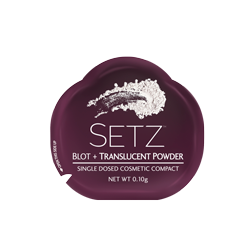 These easy on-the-go SETZ Blot + Translucent Powder cosmetic help blot away excess oil and lock in and set your makeup for long-lasting wear without adding any weight or texture, all while reducing shine. • Apply the silky powder to give you a smooth even layer of coverage to hide any skin imperfections. • After you blot, you are left with a perfect, flawless and translucent look.